Doug Lloyd, a well known extreme Victoria kayaker, has pulled his Nordkapp apart for what may be the last time. I say may because he's rebuilt it so many times that there may just be one more rebuild down the road. If not he's got a plan. "Too heavy and too far gone to rebuild. 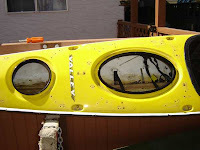 I'm thinking of filling in all the bolt holes, damage, etc, then recessing the rear cockpit rim, then lowering the volume 1/2 inch along the seam line, then making a mold of the hull and deck, then making a new boat from composites and epoxy (vacuum bagged); this would give me the layup I want with the deck features I want incorporated. 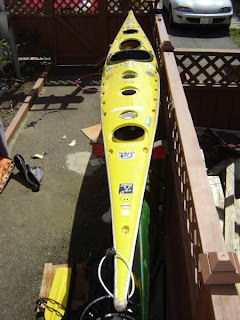 Or, I could order a new Nordkapp LV infusion epoxy made boat from the UK - about $4500.00." Doug says he'll write to Nordkapp about his plans and ask for their approval before he snaps off a new mold. He's made so many changes I can't see the point. His one off is so modified it might as well be dubbed the Lloyd Nordkapp. Although that does sound like one of those chaps with a peerage and parentage problem from back across the pond. "I say old chap, is not that Douglas Lloyd Nordkapp over there with that stunning looking kayak. Tea? Hair Hair!" Should Doug resurrect his boat I suggest he call in the Mary Ellen Carter. Google Stan Rogers. Not satisfied with the philosophical question, "How many angels can dance on the head of a pin", Doug added a rudder to the stern of his Nordkapp and added fuel to the great kayaking debate - skegg vs. rudder. 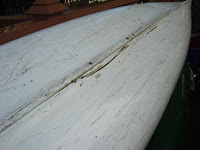 Over there on the left you can see one of the through hull scratches that facilitated new cloth on the inside. 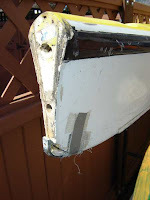 The full length keel strip is another Lloyd innovation that allowed Doug to drag his plus 100 pound boat to and from the launch site. This Nordkapp has had a long and venerable career. Nordkapp should reclaim it, hang it in their offices and send Doug a new one.